A charming wildlife tale develops from an unlikely friendship between a coati, a New World native, and a hedgehog, an Old World native, in "Spike and Ike Take a Hike." In South America, ancient Tupi language-speakers are responsible for naming the coati. The name comes from the words cua for cincture -- a bottom- and top-ringed column -- and tim for nose. A ringed tail and a tapered snout distinguish the cat-sized, ferret-faced member of the raccoon family of mammals. All coatis choose to spend most of their seven-plus-year lifespans in the treetops. They descend to the ground for exercise, predation, and socialization. S.D. Schindler fictionalizes a coatimundi -- Tupi for solitary adult male coati -- relishing a foray and a picnic. 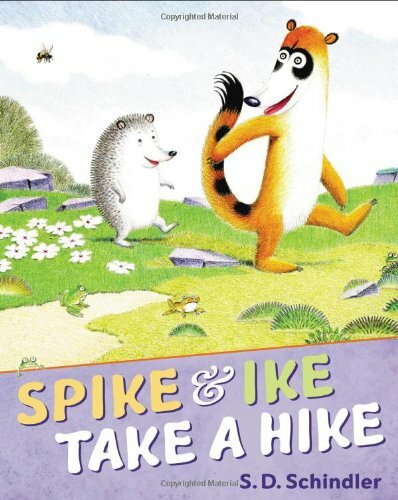 Spike and Ike Take a Hike is available -- since April 18, 2013 -- through the Nancy Paulsen Books division of Penguin's Young Readers Group. The text reads attractively in Adderville ITC Standard. Marikka Tamura receives credit for the book's design. The colored-pencil, salt, and watercolor illustrations as well as the jacket art reflect the talents of the author/illustrator. The reading level welcomes pre-kindergarteners, kindergarteners, and first-graders. The coati -- not the hedgehog (Erinaceus spp) -- is native to the Americas. Coatis resist interacting with genera other than such arthropod-, fruit-, nectar-loving fellow ringtailed procyonids as kinkajous (Potos flavus) and olingos (Bassaricyon spp). But in such wildland-urban interfaces as nature reserves and zoological parks, neither one is the other's predator or prey. The hedgehog in fact is related distantly to the shrew (Soricidae family), an introduced mammal of northern South America's Andes Mountains. Highland-dwelling coatis join in Andean habitats. Brown-nosed coatis occupy permanently forested areas. Mountain coatis prefer cloud-forest and páramo (alpine-tundra) zones below permanent snow lines. Artistic license: In S.D. 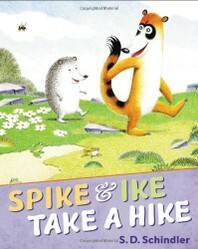 Schindler's 2013 children's story, "Spike and Ike Take a Hike," a coati (Nasua or Nasuella) pals with a hedgehog, although in real life coatis, as New World natives, normally would not be chummy with hedgehogs, Old World natives. 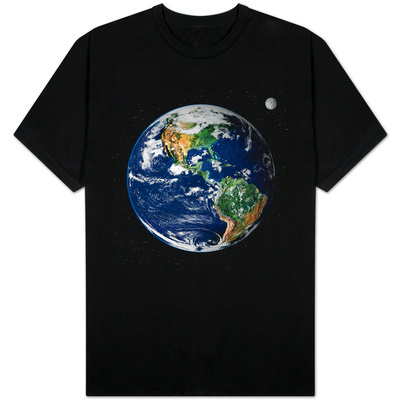 Like coatis, boobies and bumblebees frequent higher elevations. Frogs and village kitty-cats also inhabit the Andes. But in the wild, coatis and native-born African giraffes never overlap. Their meeting in wildland-urban interfaces nevertheless seems probable since lowland-dwelling white-faced coatis flourish in giraffe-style grassland and savannah habitats. The hiking buddies ultimately enjoy picnicking with Ike's cousin Rosa. The notion is not improbable. Female and male coatis meet on the ground to eat loudly and socialize noisily. University of Chicago Professor Norman Maclean (December 23, 1902 - August 2, 1990) advises understanding life's truths by fictionalizing characters and events. S.D. Schindler does just that. Although considered to be carnivores, coatis (Nasua and Nasuella) are opportunistic omnivores; they especially favor nectar of balsa (Ochroma pyramidale) flowers. Decker, D. M. (1991). "Systematics of The Coatis, Genus Nasua (Mammalia, Procyonidae)." Proceedings of The Biological Society of Washington 104: 370-386. Maclean, N. (1976). A River Runs Through It and Other Stories. Chicago IL: University of Chicago Press. Schindler, S.D. (2013). Spike and Ike Take a Hike. New Y ork City NY : Nancy Paulsen Books Division of Penguin Young Readers Group. When Spike and Ike take a hike, they meet lots of sassy creatures along the way. Coatis are New World natives. The brown-nosed, ring-tailed, South American coati (Nasua nasua) is an amusingly social, eminently domesticable, intelligently observant wild species of the subtropics and tropics.